After my first yoga class nearly 15 years ago, I left the studio feeling like I was walking on air. The divine intersection of clarity and calm that I’ve since identified as zen was wrapped around me, ushering me through the world. That feeling was so intoxicating and empowering that I kept going back for more: I’ve probably taken close to 3,000 yoga classes since then, even completing teacher training a few years ago. I’ve also found my soul at the bottom of a heaven-sent cocktail on more than one occasion -- and I’ve wondered whether these indulgences make me a bad yogi. Yoga is in large part a discipline of restraint and mindfulness, and guzzling two-for-one happy hour draughts while gossiping about former colleagues doesn’t exactly fit the bill. But it’s also as much about what you’re giving yourself as it is about what you’re taking away. Imbibing will never be as healthy as mastering Eight-Angle Pose. But a glass of wine with a friend can be as enriching as your nightly vinyasa. It’s no wonder that what started as a trend integrating yoga with wine has extended to pairing other kinds of wellness practices with cocktail hours and beer tastings. Both wellness -- a recently maligned word-turned-slogan that really just amounts to any fitness-adjacent activity -- and a little liquid courage are necessary now that the zeitgeist seems in want of an exorcism. And this type of self-care is particularly alluring during this time of year, when the heightened indulgences and intensity of the holidays juxtapose with the looming expectations of being your best self come the new year. Adopt an early resolution and take care of yourself. Here is everywhere you can chase your relaxation with libations in New York City. This roving series aims to “lift your spirits” and create community around the “potent union of yoga and social ritual” at spots like Drexler’s, Grey Lady, Solfire, and Sanger Hall. Each Drunk Yoga class begins with a 15-minute mingle with a glass of wine (multiple varietals on offer are typically local and organic), pivots to a 45-minute vinyasa class (beverage in hand), and ends with a 10-minute “wine down.” If you fancy caffeine over booze, you can get lifted in the morning at the new monthly Coffee Drunk Yoga series. You’ll see Uplift’s mission to “empower women in all aspects of their lives” in practice during Friday night Happy Hour classes. Power Happy Hour employs high intensity interval training to improve endurance, and Strength Happy Hour focuses on heavy weight lifting to build strength. Classes are exclusive to women, and Uplift works with local businesses like Tipsy wine shop and a rotating cast of women-owned catering companies to provide complimentary snacks and wine after class. Sputnik Yoga is a nomadic practice that pops up in curious locations like a mattress store and a clothing shop. Classes wrap up with vodka cocktails like the aptly named Balancing Act, made with lemon vodka, jalapeño, and rosemary. Crown Heights is one of NYC’s most active and community-driven neighborhoods -- so Jewel City, a serene yoga studio and earnest social justice bookstore, fits right in. Their new monthly Vino + Vinyasa series starts with an hour-long class before by a short walk over to the local bar St. Ends for a complimentary glass of wine and neighborly mingling. The beloved Bronx craft brewery behind the city’s favorite “no nonsense ales” explores the parallel traditions of “ritual, balance and community” that are particular to yoga practice, beer making, and life in the Boogie Down. 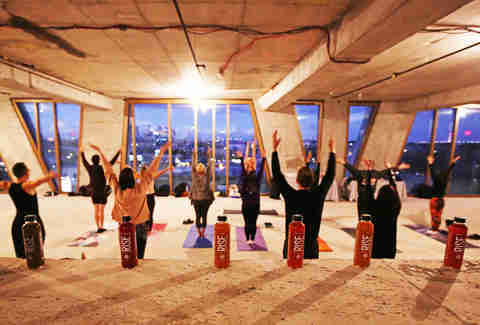 Monthly Brew You Yoga classes include an hour-long vinyasa session and a five flight beer tasting. Yoga Unwined, whose mantra is “Pose + Learn + Sip,” aims to make the yoga + wine experience both productive and educational. 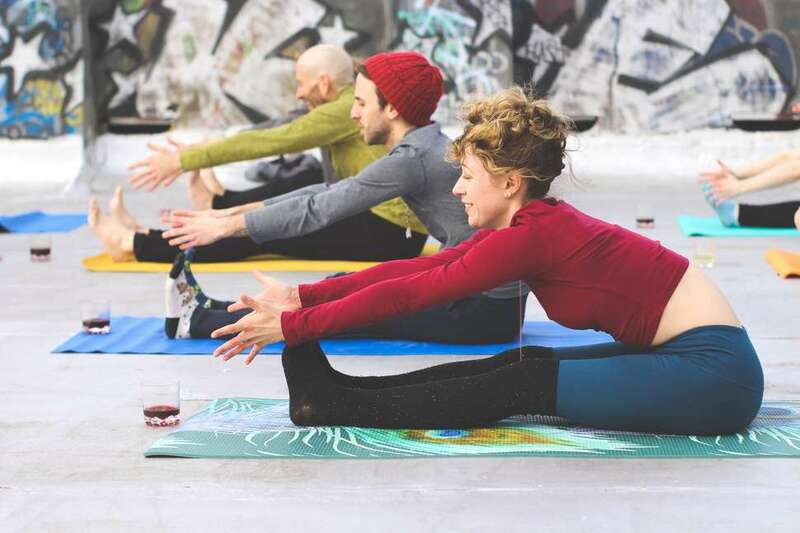 Pop up vinyasa classes that integrate creative yoga poses and fun wine facts are followed by educational wine sessions featuring specific wine varietals; last month was Pinot Noir, this month is Cabernet Sauvignon. Unwined at The LOFT City Winery on November 18, and at the The William Vale (where you can also sip kombucha before class) on November 27. The ancient Tibetan practice of sound bathing is “an immersion in sound frequency that cleans the soul,” according to sound meditation specialist Monte Hansen. 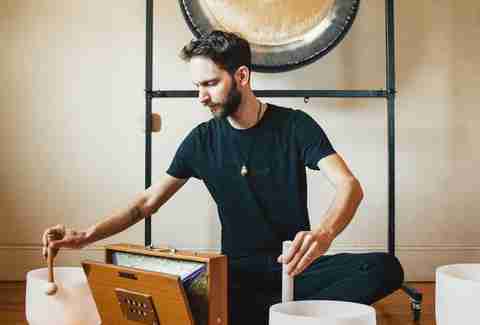 During this fall Sound Bath Residency at One Thousand Birds’ NYC studio, you’ll sit or lay in a comfortably dark room while musician Alex Beckmann uses gongs, singing bowls, and overtone emitting instruments to guide a healing sonic meditation. After the meditation, you’ll keep the good vibrations flowing at a nearby watering hole (RSVP required). This quarterly fundraiser meets yoga practice meets happy hour is all about returning to yoga’s foundation as an exercise in generosity and community-building. The most recent class was followed by hors d’oeuvres and Champagne catered by chef Charlie Marshall (Dianne & Elisabeth, The Marshal), and ticket sales benefited Housing Works. Future event details are announced via the Yogaloves newsletter. Victoria Marin is a writer and digital content producer based in Brooklyn. Follow her on Twitter.